4:1 Let me put it this way. Say a son inherits his dad’s estate, but the son is just a kid. At that point, the son is no better off than a slave, even though he owns the whole estate. 4:2 The kid is no better off because he has to do what his guardians tell him to do. 4:4 But when God decided the time was right, he sent his Son—born to a woman who lived like a slave to Jewish law. 4:5 Jesus came to save people like us who have been enslaved by the law. He did it so we could be adopted as God’s children. 4:7 So, you’re not a slave anymore. You’re a child of God. And since you’re his child, you’ll inherit everything he has for you. 4:8 Back when you didn’t know God, you were slaves to fake gods. 4:9 But now that you know God—or maybe it’s more accurate to say God knows you—why would you go back to living your life according to some basic rules3 of this world? Those rules are weak, and they’re a poor comparison to what God has for you. Why are you letting those rules enslave you again? Do you like being slaves? 4:10 You have some “obsessive, compulsive” going on when it comes to rules about religious holidays. You meticulously observe Jewish laws about what you’re supposed to do on certain days, months, seasons, and years. 4:11 I’m afraid I wasted my time with you. 4:12 Family, come on. Follow my example. I gave up the laws and became like you non-Jews. Know this, too: I don’t feel that you’ve done me wrong. 4:13 You remember that the first time I came and preached the Good News to you, I was sick. 4:14 I know I was a burden to you then. But you didn’t treat me like that. You didn’t look down on me or tell me to get the dickens out of town. You welcomed me with honor. You treated me like I was an angel sent from God, or even the Messiah, Jesus. 4:15 What happened to you? Where’d the joy go? I swear, there was a time when you’d tear your eyeballs right out of your head and hand them to me, if I had asked. 4:16 But now, suddenly I’m your enemy for telling you the truth? 4:17 Well then, let me tell you one more thing. Those folks4 you’re listening to are trying to get on your good side. Not for good reason. Instead, they want to turn you against me—so they can replace me. 4:19 My children, I feel like I’m going through the pains of childbirth, waiting for you to become newborn followers of Christ. 4:20 Oh, I wish I could be there with you. And I wish I didn’t have to write in such a harsh tone. I don’t know what to do about you. 4:21 Okay, tell me this, you people who want Jewish law to control your life. Why don’t you practice what you preach? Why don’t you do what the law says? 4:23 Both had sons. The son of the slave was born the natural way.8 The son of the free woman was born of a promise God made to Abraham. 4:24 This story is an allegory, rich in symbolism. These two women represent two contracts9 God made with people. First contract: made at Mount Sinai.10 This agreement between God and the Jews produced a nation enslaved to laws. In this allegory, Hagar, the slave, represents that contract. 4:26 Second contract: made with the free woman.13 She’s our true spiritual mother. She represents Jerusalem in the heavenly world. yes, you, the one who hasn’t given birth. 4:28 You, dear family, are the freedom kids—children of the promise, like Isaac. 4:30 Remember what Sarah told Abraham? “Let’s get rid of this slave and her son. 4:31 So, dear family, you can see we’re not kids of the slave woman. We’re the free woman’s kids. Paul is referring to the Jewish law, preserved in the books of Exodus, Leviticus, Numbers, and Deuteronomy. As in 4:3, Paul is likely referring again to the Jewish law. Many Bible experts say Paul is talking about a group of Jewish Christians called Judaizers. They taught that to be a good Christian, you first had to be a good Jew—someone who observes the Jewish laws that Moses delivered when the Jews made their escape from slavery in Egypt. Some Bible experts say this phrase reads like a famous old saying that Paul may have been quoting. Paul’s implication is that the folks courting the Galatians now aren’t doing it “for good reason” (4:17). The slave was Hagar (Genesis 16:3) and the free woman was Sarah (Genesis 11:29). Sarah gave Abraham her personal slave, Hagar, as a secondary wife. In a sense, Sarah wanted to help God fulfill his promise to old Abraham: “Look up at the sky. See all those stars? Can you count them? That’s how many heirs you’ll have.” (Genesis 15:5). Sarah wanted Hagar to give Abraham an heir. Mount Sinai is where God gave Moses the Ten Commandments and other laws for governing the emerging nation of Israel, while the people were still Jewish refugees on their exodus out of slavery in Egypt. 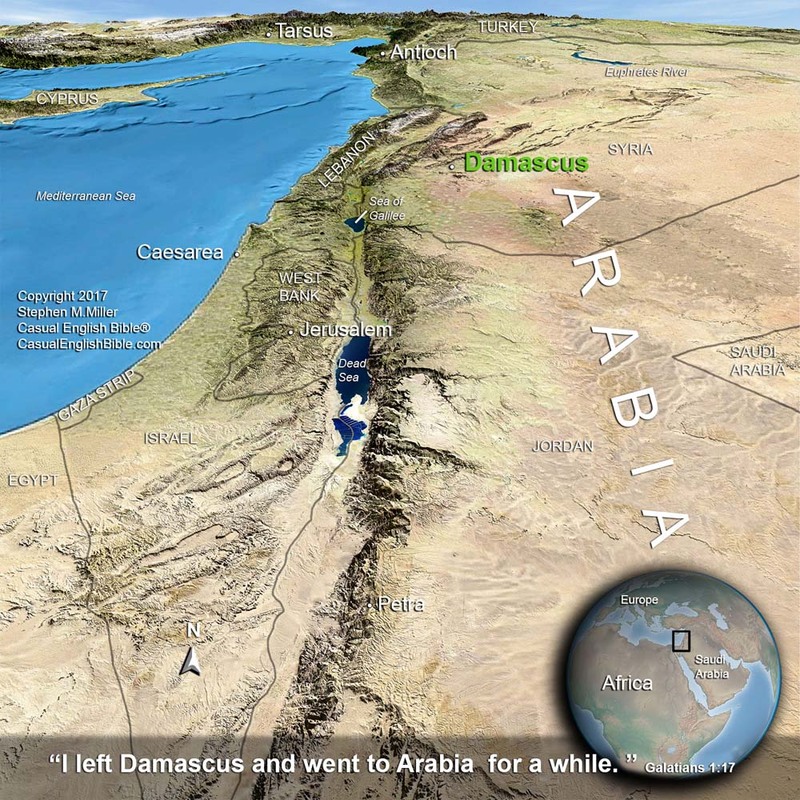 In Roman times, Arabia was the land east of Israel: Southern Syria, Jordan, and Saudi Arabia. 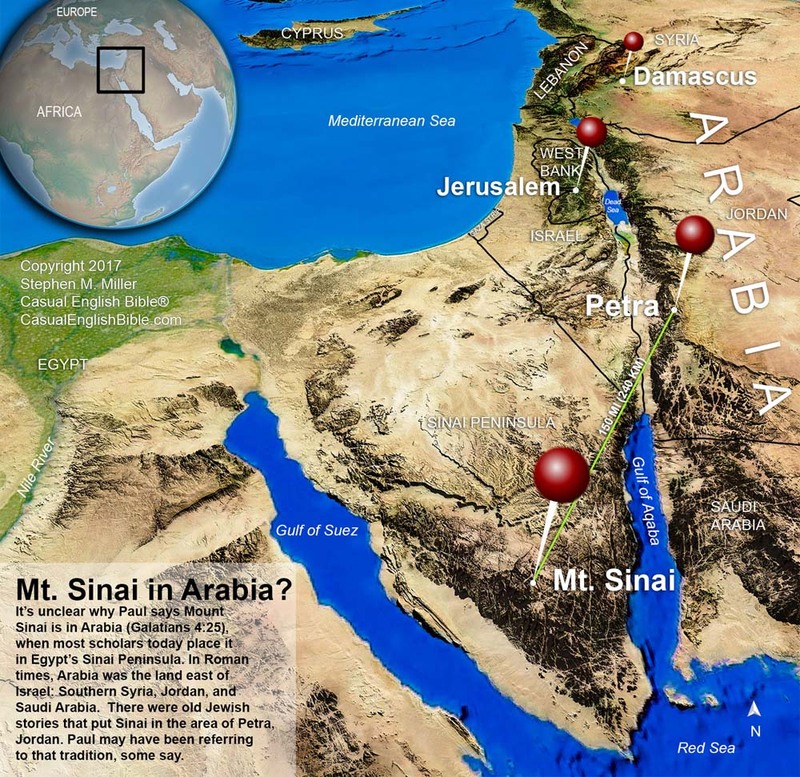 It’s unclear why Paul says Mount Sinai is in Arabia, when most scholars today place it in Egypt’s Sinai Peninsula. But there were old Jewish traditions that put the mountain in the area of the ancient Rock City: Petra, Jordan. Paul may have been referring to that tradition, some say. Jerusalem became the political and spiritual capital of the Jewish nation. It is where Jewish laws were strictly enforced. Some Jews in ancient times treated this prophecy from Isaiah 54:1 as an end-time prediction of what the future Jerusalem would be like. Some Bible experts say the woman living comfortably with her husband represents Jerusalem before Babylonian invaders, from what is now Iraq, leveled the city and deported most of the survivors. The woman devastated, but with more children, means that returning Jewish exiles will rebuild the city and Jerusalem will be bigger than before. Paul uses some word pictures in this chapter to explain why the Galatian Christians didn’t need to feel obligated to obey Jewish laws. How do you think the Jewish Christians who continued to obey Jewish laws felt about Paul comparing them to kids “no better off than a slave…because he has to do what his guardians tell him to do” (4:3)? Paul says odd things from time to time. Odd as in tough to understand. Here’s one: “You are God’s own children. That’s why God has put the Spirit of his Son inside our hearts. And that’s why we call on God, crying, ‘Papa. Father’” (4:6). What do you think he was trying to say there? 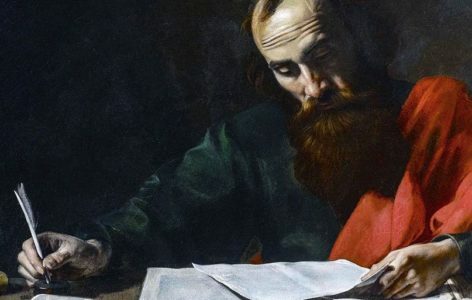 In a nutshell—which is where many Jews probably felt Paul belonged—Paul essentially argued that God had a two-part plan for saving people from sin. Part 1: Obey the laws of Moses until Jesus comes. Part 2: Obey the laws that the Spirit impresses on your heart. But if Jewish Christians argued that there’s no reason why Part 1 and Part 2 can’t co-exist, what are some of the key points, questions, or criticisms you think Paul probably heard and fought against? Paul uses this chapter to work his sales pitch: You don’t have to follow Jewish laws anymore. What do you think is the single most effective statement he made in trying to sell his pitch? Paul uses the story of Abraham’s two sons as a word picture to help the Galatian Christians break free from the Jewish laws. He treats the story as an allegory, which is a story that contains a hidden meaning. Paul says the hidden meaning is that Abraham’s son born to a slave woman represents people who feel enslaved to the Jewish law. And Abraham’s son born to the free woman represents Christians who are free from the law. Which option here do you think best describes Paul’s explanation? It would have been a powerful argument, since Abraham was the father of the Jews. It doesn’t make sense to me, but it probably did to the people back then. LIFE APPLICATION. Paul asks the Galatian Christians “Why would you go back to living your life according to some basic rules of this world?” (4:9). What do you think is a parallel today? What are some “basic rules” that many Christians expect all Christians to live by—rules that may not be necessary or appropriate for some Christians? LIFE APPLICATION. Just for fun, let’s say you wanted to take on some of the rules of the church that you think are unnecessary or perhaps way out of line, and maybe even harmful to the growth of the church. How do you think it would go over if you used some variation of the argument Paul used when he talked about the sons of Abraham? And let’s assume you ended your sales pitch with the punch in the face that Paul used when he told the Galatians it was time to get rid of their slavery to Jewish laws: “Let’s get rid of this slave and her son… We’re not kids of the slave woman. We’re the free woman’s kids” (4:30-31).